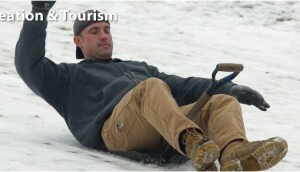 UPDATE: the Snow Shovel Riding is postponded to Saturday, January 21, 2012. I sure hope it snows this week so that they don’t have to cancel this event. Yes, it is the 46th Annual Snow Shovel Riding event. If there isn’t enough snow the event will be rescheduled for February. You can read about last years competition here.